No matter what your industry – Food and Beverage, Chemical, Industrial Assembly – we have the exact products and services to support your business. A lubricating grease is a semi-solid product of the dispersion of a thickening agent in a liquid lubricant. The lubricating grease operates by releasing the lubricating fluid from the thickening agent and provides a way to supply a lubricant where the use of oil is not practical. Molykote® high-performance greases are designed and tailored for use under extreme conditions like extreme pressure, harsh chemical environment, low and high temperatures and all speeds. Molykote greases are based on mineral oils or synthetic fluids including silicone oils. 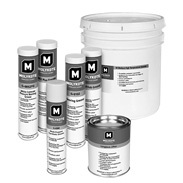 A number of Molykote greases contain special additives and/or solid lubricants like Molybdenium disulfide to provide effective lubrication.